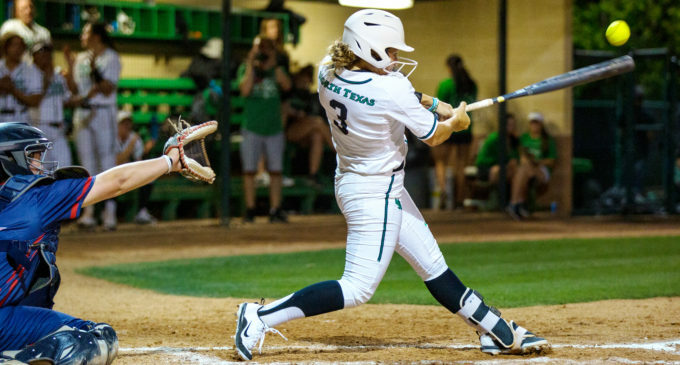 The North Texas softball team (25-12, 10-2 Conference USA) fell short in a late-game rally to Houston Baptist (15-17, 4-10 Southland) in Houston 8-6. The Mean Green led for five and a half innings, but the Huskies put up six runs in the fifth inning to run away with the game. The Mean Green scored three runs in the seventh inning off of junior Nicole Ochotnicki’s two-run RBI single. However, the late comeback effort was not enough to make up for the three scoreless innings which DeLong believed affected the teams play. Sophomore Hope Trautwein started the game for North Texas, pitching for 4.2 innings allowing six runs on five hits. DeLong pinpointed the defensive lapses mid-game as what let the Huskies get on the board. Freshman Bailey Tindell relieved Trautwein for 1.1 innings, allowing two runs. Junior Sally Gestello continued her hitting streak by going 2-for-3 with two runs scored. After the loss, DeLong is ready to move on and start preparing for the conference matchup this weekend. UP NEXT: On April 13-14, North Texas will move on to face the Western Kentucky Hilltoppers (27-8, 10-2 C-USA) in Kentucky. The Mean Green and the Big Red are in a three-way tie with the Louisiana Tech Lady Techsters (31-9, 10-2 C-USA) for the best record in the conference. Featured Image: In the top of the third inning, junior Haley Perella battled the count with a foul ball at the game against Saint Mary’s at Lovelace Stadium on April 5, 2019. Image by: Kara Dry.